On Nov. 1, Gov. Tom Corbett signed Senate Bill 358 into law. The bill, authored by Sen. Bob Mensch (R-Bucks/Lehigh/Montgomery/Northampton), requires U.S. Food and Drug Administration facilities to notify women of their breast density, which can impact the effectiveness of traditional mammograms. Identical legislation was introduced in the Pennsylvania House by Rep. Karen Boback (R-Columbia/Luzerne/Wyoming). Pictured are (from left): Boback, Corbett and Mensch. HARRISBURG – Gov. 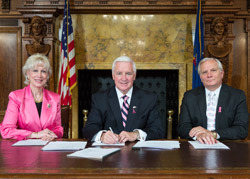 Tom Corbett today signed Senate Bill 358, according to Rep. Karen Boback (R-Columbia/Luzerne/Wyoming). The new law requires U.S. Food and Drug Administration facilities to notify women of their breast density, which can impact the effectiveness of traditional mammograms. The legislation was authored by Sen. Bob Mensch (R-Bucks/Lehigh/Montgomery/Northampton) and an identical bill was introduced in the House by Boback. The legislation requires FDA facilities to provide patients with information regarding their breast density, including recommendations to contact the referring physician should the patient have questions or wish to discuss the report. The new law will take effect in 90 days.